Did localised campaigning save Labour at GE2017? Guest writer Joseph Fox argues that Labour candidates at general election 2017 – from across the party’s ideological spectrum – ran highly localised campaigns and shows that this was in stark contrast to a very centralised Conservative campaign. During the 2017 General Election the majority of Labour incumbents chose to campaign on their own records and shun national politics, resulting in a focus on; local issues for residents, personal popularity and past achievements. This was in stark contrast to the Conservative campaign, which was almost solely based on the national political arena, with an endless focus on Theresa May and her strong, stable character. Few political analysts have explored this contrast as a possible factor in the retention of Labour seats. To explore this idea, it may be helpful to take three Labour candidates from three different factions within the party. Factionalism has become so entrenched that this is the only way to analyse Labour as a whole. Wes Streeting, Vernon Coaker and Cat Smith were three MPs who were expected to lose their seats, each sitting on wafer thin majorities after 2015 of; 589, 2,986 and 1,265 respectably. Wes Streeting firmly from the Progress-wing of the party was expected to lose his Ilford North seat. Streeting was up against Lee Scott – former Conservative MP for the area – who sat on a majority of 5,404 in 2010. During the 2001 census, Ilford North had the fourth-highest Jewish proportion of residents at 10.3% of the population. Streeting was very outspoken throughout the period of the Chakrabarti Inquiry and a critic of the leaderships handling of the issue. Streeting decided to avoid national politics throughout his 2017 campaign and focused solely on his local record. Streeting’s website featured issues solely related to Ilford North, avoiding any mention of national politics, even Brexit. This revolved largely around the possible closure of the King George A&E Unit in his constituency. His website also featured a video endorsement by David Miliband. Streeting also followed the tactic of almost all London Labour MPs by using Sadiq Khan as a de-facto leader. Mobilising Khan in this way focuses campaigning on London’s internal politics. Much of Streeting’s campaign literature was incredibly personalised, with posters, featuring Khan, exclaiming ‘We’re With Wes’. Streeting’s leaflets interestingly highlighted a statement proclaiming, ‘I’m an independent-minded representative who’ll always put you first’. Once again severing any ties between Wes and the party leadership. The Conservatives’ clearly viewed the national political debate and party leadership as Wes Streetings’ biggest weakness in his fight for Ilford North, with Lee Scott’s campaign using material directly in coordination with CCHQ. This included the ‘Theresa May’s Team’ and ‘Strong and Stable’ branding, seen in leaflets and placards below. Streeting managed to increase his vote share by 13.9%, achieving a 9,639 majority. Vernon Coaker, MP for Gedling since 1997 has always had a slim majority. From the centre-left of the party and serving in Corbyn’s shadow cabinet up until the 2016 Leadership Election, Coaker was widely expected to have his 2,986 majority overturned. 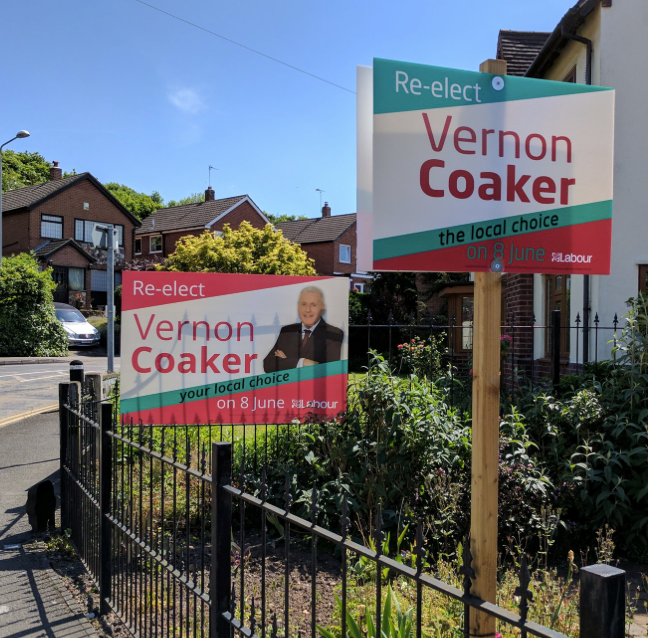 Coaker, a former councillor and leader of the Labour group on the council, had a strong local presence in the constituency and thus opted for a highly localised campaign. The electoral fight for Gedling mirrored the national picture on the ground throughout the election campaign; a Labour campaign focused on the local candidate and local issues, with the Tory campaign focused on the question of national leadership. Coaker seemed to avoid shadow cabinet visits and instead opted for visits by neighbouring MPs Yvette Cooper and Ed Miliband. Similar to Ilford North, there were no visits by Corbyn. Coaker’s campaign material was deeply localised. Focusing on issues within Gedling and putting a localised spin on the issue of Brexit, with no mention of national politics or the issue of national leadership. Coaker even had his own distinguishable colour scheme. The Tory campaign was another bare boned effort, with a centralised national message, drawing the voter to the issue of national leadership. With an endless focus on Theresa May. The campaign also seemed to have very few publications focusing on local issues within Gedling. Vernon Coaker increased his majority to 4,694, representing a rise in his vote share by 9.6%. Cat Smith gained the seat of Lancaster and Fleetwood in 2015 with a slim majority of 1,265. A tight Labour-Tory marginal, Smith was expected to lose her seat. Firmly on the left of the party, Smith has supported Corbyn ever since he announced his leadership campaign on the 3rd June 2015. However, Smith’s loyalty to Corbyn and continued membership of the shadow cabinet did not result in her Lancaster and Fleetwood campaign featuring material focusing on national leadership. Smith appeared to avoid national politics and her campaign avoided Corbyn and instead focused on local issues. The campaign continually used the ‘#KeepCat’ slogan on t-shirts, badges and social media. The focus was firmly on her as the candidate and the issues on local politics, with much of the campaign material titled ‘A strong independent minded voice for Lancaster’. In stark contrast, mirroring the other two constituencies, the Conservative campaign was derived from the national party narrative. The Conservative candidate, Eric Ollerenshaw was the MP for the area up until 2015, yet his campaign sucked any personal branding out of this fact and instead focused on Theresa May. Cat Smith managed to increase her vote share by 12.8% with the size of her majority at 6,661 votes. The Conservatives’ impersonal, centralised and May-obsessive campaign in these three constituencies and indeed across the country, seemed robotic and inauthentic. This was in stark contrast to the engaging, localised and personal campaigns offered by Labour candidates in these constituencies. In these three constituencies, the local Conservative candidates were side-lined by their own party, while the Labour candidates promoted themselves at the expense of their party leadership. It essentially became the Conservative machine versus your local MP. The devolution of Labour branding and campaign control certainly played a role in the electoral success of these candidates.